President Barack Obama has met Pope Francis for the first time during a European tour dominated by the crisis in Ukraine. Barack Obama flew into Rome after three days of talks with world leaders in the Netherlands and Brussels. In a recent interview published before their meeting, Barack Obama described Pope Francis as a man who “lived the Christian Gospel”. Deputy National Security Adviser Ben Rhodes said Barack Obama has been inspired by Pope Francis’ messages of inclusion and equality. Ben Rhodes said Barack Obama planned to express his appreciation for the pontiff’s leadership. Barack Obama and Pope Francis have very different views on subjects such as abortion, contraception and gay marriage, but at this meeting they are likely to emphasize what they share. 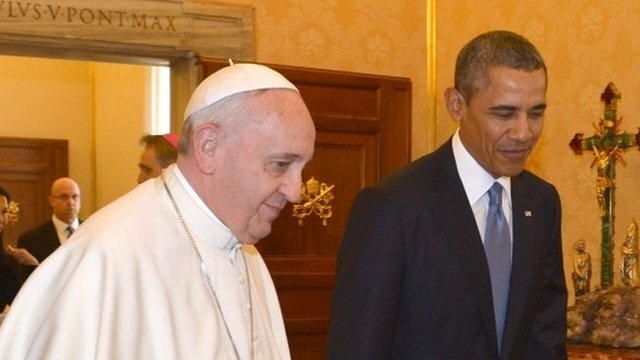 After meeting the Pope, Barack Obama is due to meet both Italian President Giorgio Napolitano and PM Matteo Renzi. Barack Obama is accompanied in Italy by Secretary of State John Kerry.